Add a playful and colorful element to your lighting with this tropic drum shade. The design features an abstract floral design in a cotton blend fabric with a rolled edge and a chrome finish spider fitting. - 14" across the top x 16" across the bottom x 11" on the slant. - Unlined inside with a chrome finish spider fitting. - A vibrant design from the Springcrest Collection™ brand of lamp shades. 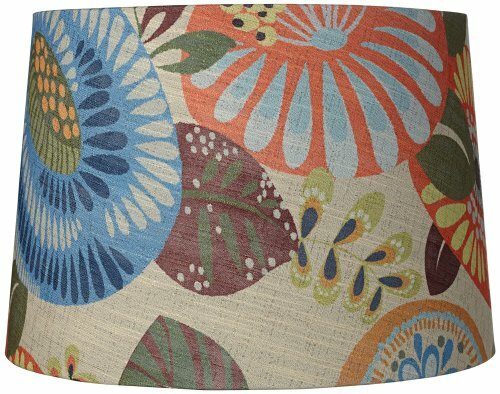 - Colorful cotton blend fabric drum shade with a tropical flower and leaf pattern. Unlined inside with a chrome finish spider fitting. A vibrant design from the Springcrest Collection™ brand of lamp shades. Colorful cotton blend fabric drum shade with a tropical flower and leaf pattern.